Most “I followed my dreams” stories seem to be written after the author is cozy in their new life. Seldom do we read accounts of people in transition and hear about the doubt, uncertainty and fear that accompanies new journeys. I am about to quit my job and move to LA to try and make a living as a writer. I don’t know if I’m at my most inspired or most delusional. I went to Don Quixote for answers. Somewhere along the line, I became obsessed with the word “quixotic.” According to Wikipedia, it means, “Foolishly impractical, especially in pursuit of ideals; marked by rash, lofty, romantic ideas or extravagantly chivalrous action.” The word originated from the literary character Don Quixote, the hero in Miguel de Cervantes’s novel of the same title about a middle-aged squire who suffers a nervous breakdown, changes his name and embarks on an ambitious quest to slay giants, sack castles and win the heart of a most beautiful maiden. The only problem was that his quest was a fiction. The giants were in fact windmills. The castle’s inhabitants were not enemies, but village folk. And his lady fair? Like the others, just a figment of his overactive imagination. I was first introduced to the word “quixotic” after reading about the death of Dean Potter, the extreme athlete and climber who died tragically this May in a wingsuit accident. Potter seemed to represent the ultimate form of living—cheating death. I’ve always admired extreme athletes for this reason, especially Alex Hannold, a legendary climber who often scales cliff faces without ropes, a controversial technique known as “free soloing.” A few weeks after Potter’s death, Hannold published an article in Time where he extolled the athlete’s perspective on life, referring to Potter’s pursuits as “quixotic.” A day after reading the article, a friend visited me from out of town and pulled from his duffel bag the novel, Don Quixote. He was fresh out of graduate school—jobless, but hopeful. He said he always gravitated to the book whenever his life was in transition. And then it struck me. I too was in transition. I used to be more quixotic, but several years in office settings have left me rather timid, downright docile, at times. I think this can happen when you’re a staff writer in business settings. A hired gun is subject to committees and perfunctory analysis. “It’s just, I don’t know, kind of long.” “Can you end this article with a question? More people will comment, if there’s a question at the end.” In the “conceptual age,” employers tell journalists from Inc. Magazine that they want creative types: employees with big ideas, high EQs, and technological savvy; right and left-brainers. On paper, they’re God’s gift to capitalism. Supervisors implore them to give them their ideas, but what they don’t seem to realize, or acknowledge for magazines, is that “good” ideas are typically path-breaking, oftentimes irreverent and almost always impractical. In rather short order, these once coveted workers are perceived as idealistic, cavalier, too honest, perhaps impulsive, romantic, and even crass or impolitic. Employers forget that the same imagination that originates the best ideas also has little interest in politics and typically questions authority and seeks reformation—all of which can undermine the institution or defy departmental standards. Bosses start to wonder if they’ve hired a trouble-maker. These employees soon realize that if you keep rocking the ship, they’ll throw you overboard. After that, I decided to bite my tongue, be more careful, more diplomatic. I drove my ideas into computer screens—novels, screenplays, articles and essays. But I could no longer ignore the gravitational pull of writing on my own terms, and to concentrate most of my efforts on writing for the screen, a medium I had come to learn was most naturally aligned with my abilities. So, I decided to go for broke. I spent six months dismantling what I had worked hard to build, laying the groundwork to throw away a perfectly good job to hopefully become a working dramatic writer. As you can imagine, doubt crept in. Uncertainty took hold. When I came back down to earth, I second-guessed myself. I began to see the novel Don Quixote as a mirror through which I could see myself. Like Quixote, I mused: was I battling giants, or tilting at windmills? Self-actualized, or self-sabotaging? Am I moving to Los Angeles (of all places) to find myself, or lose myself? And here’s the headiest part: Is what I want, what I actually want, or do I just enjoy wanting? I contacted Dr. Matthew Schneider, Professor of English and Associate Dean of the David R. Hayworth College of Arts and Sciences at High Point University in North Carolina. Matthew had written an article entitled, “Howard Hughes and Don Quixote.” I thought he might be able to comment on transitions through the lens of Cervantes’s magnum opus. Matthew says persisting in the face of such resistance takes self-determination, defined as the “freedom to live as one chooses, or to act or decide without consulting another or others.” It’s deciding who we are and what we want to be. Don Quixote was a champion of self-determination. As you read the novel, you can’t help but admire Quixote for his conviction, but also feel pity for the protagonist, as he sells his farmland and lets his house go to ruin while binging on novels about romantic chivalry. When Quixote finally embarks on his quest, he does so atop an old horse, wearing rusted armor and a helmet with a cardboard face guard. When he arrives at an ordinary inn, he mistakes it for a castle. He identifies the innkeeper as “governor” of the castle, and two prostitutes as “ladies of the game.” At first, the village folk are confused, but, seeing Quixote’s conviction, eventually treat him like the knight he believes he is and talk with him in the terms of his world, which is obviously delusional. The innkeeper recites a hymn for Quixote, as if he were a knight, and the prostitutes willingly play the parts of fair maidens. 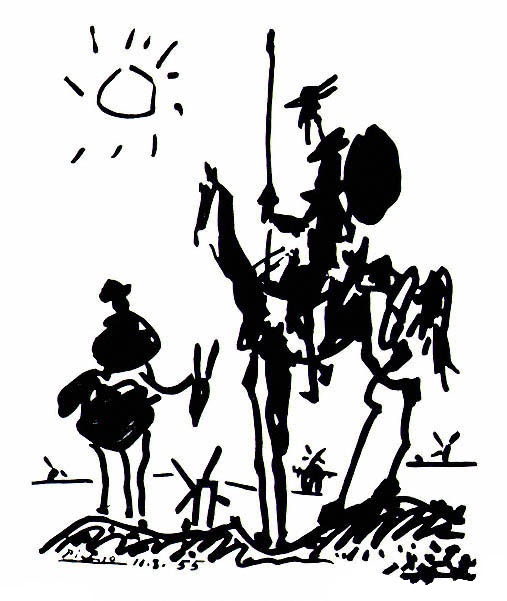 As a character, that is Quixote’s charm and fatal flaw. He proclaims: I know who I am and who I choose to be. So what if it’s fake. “He chose a totally different—and completely fictional—persona,” says Matthew. “And through the sheer force of his self-belief, he managed to get the world to adopt a standard of living, a mode of address, even a way of acting.” Quixote showed that when you’re transitioning, or assuming a new identity, strong conviction, even delusion, can go a long way. Eventually, the world accepts the identity you’ve assumed. The world conforms to you. Whether businessmen, scientists, engineers or artists, Quixotes are men or women on quests. They exhibit relentless drive, unrestrained curiosity and original vision. But their genius is their unflinching belief in themselves and their own pursuits. Writes Matthew, “The Aviator touchingly portrays Hughes—damaged psyche and all—repeatedly asserting, with bracing valor, his quixotic right of self-determination.” This is who I am. Deal with it. In my case, I just want to tell stories. Big ones, small ones; meaningful ones, absurd ones. What’s more quixotic than wanting to make stuff up for a living? To want to create dreams. Perfect worlds. Isn’t it just a tad quixotic, perhaps even egotistical, to think that your ideas will change minds and influence culture? That your tightly packaged inventions hold truths that others can’t see? To nourish the utopian idea of artistic freedom—to be able write what you want, when you want… and get paid for it? Perhaps my doubt was the result of not having fully convinced myself yet of my dream. I was being rather prudent. I made the decision to leave my job nine months ahead of time, and then spent months planning, preparing first for a three-week trip in China, and buying supplies for a motorcycle trip across the country, putting off the moment I would break the news to my employer. When I finally worked up the courage to tell my boss I was leaving, I told a story—the time I applied to a MFA program this winter and the senior admissions officer told me that the writing department reviewed my work and said that I didn’t need the program, that I should just go to LA and try and break in. Because I had “talent.” My boss understood it was my dream. More importantly, she saw the conviction on my face. She admired me, perhaps envied me. Like a fine Quixote I was out of touch with reality. I underestimated (okay, disregarded) the high altitude on Kilimanjaro, and suffered from altitude sickness. Six months into the graduate program, I switched from a PhD to a Master’s, realizing that a life in science wasn’t for me. While driving across country, my car’s brakes wore down to nothing, and the electric engine fan broke, causing us to breakdown several times due to an overheating radiator. The philosophy class ended and turned into a philosophy group, which I attended enthusiastically, at first, and then just stopped going one day. The skydiving certification? When I didn’t jump the first day due to high winds, I never returned. The motorcycle? I drove it once, and didn’t touch it again for a year. The common thread: fantasy is better than reality. Most of us are quite comfortable listening to the half-dust part of psyche. It’s the “sane” thing to do. But we are also half deity—“insanity” is built into our very nature. It’s our madness and our genius. Our charm and our fundamental flaw. In times of transition, perhaps it’s best to entertain both parts. To acknowledge the dust, but embrace the deity. To act from the spirit, but stay grounded in the facts. A middle ground between realistic cynic and Pollyanna dreamer. But if you had to pick just one part, choose deity. Choose self-determination. Better deity than dust, I say. Because if Don Quixote and other dreamers have taught us anything, it’s that reality becomes what you believe it to be. Am I insane? Perhaps. But you’ll see it my way, eventually.